In Harold’s lab, Donatello-as-Metalhead finishes prepping his body to be moved to the lair. He’s trying his best to put on a brave face (so to speak), but being trapped in a robot body has been an upsetting experience. Outside, Alopex tries to cheer Raphael up, reassuring him that he and his brothers made the right choice by taking down the Technodrome instead of staying behind with Donnie. 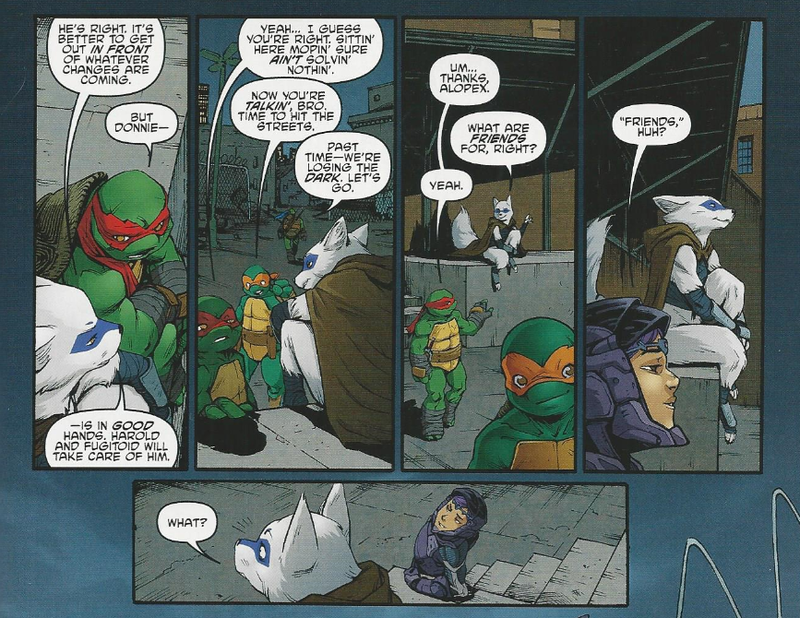 Leo interrupts and tells Raph that they need to go on patrol, especially now that the Shredder’s gone and the city’s underworld is in upheaval. Nobody and Alopex decide to go on their own patrol, starting with the Second Time Around shop. At said shop, Casey walks in to find a drunken Hun jovially conversing with April’s (terrified) parents. Rather than making trouble, Hun is celebrating, claiming that with the Shredder dead, he now runs the Purple Dragons exclusively and doesn’t have to follow his oath to kill his own son. He wants them to be a family again, but Casey just tells Hun to leave. Hun storms out just as Nobody and Alopex arrive. The pair then introduce themselves to April’s folks. 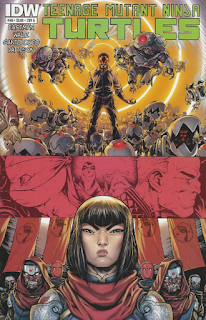 At Foot HQ, Karai gives a stirring speech to the clan, vowing to steer them down a new path of prosperity. Her first order of business is to put a moratorium on allowing outsiders into the family. Her second order of business is to eradicate those who attacked or betrayed the Foot and tried to bring them down. Back at the lab, the Fugitoid tries to help Donnie adapt to having his mind in a robot body while Harold sees to Metalhead’s repairs (the robot having been trashed by Bebop and Rocksteady). Outside Rupert’s Pizzeria, Mikey shares a slice with Woody and updates him on what his family has been up to. Woody cheers him up with a pep talk and the two part ways. April approaches Dr. Miller in his office to see what he’s come up with. Apparently, he stole a scroll from the Foot Clan archives and has been studying it. According to the ancient text, there existed a Pantheon of powerful immortals who once ruled the Earth. A great flood destroyed their civilization and ushered in the age of mortals. The family then took on strange guises (such as an ox, a fox and a rat) to initiate a “game” wherein they would manipulate the course of human history. Ultimately, the winner would seize control of the world. Dr. Miller mentions a book with even more information on the Pantheon, though he reveals that it has been hidden somewhere in the American southwest for years. April decides to take the scroll from Dr. Miller so Splinter can have a look at it. …Dr. Miller begins to regret his decision to betray the Foot Clan. He regrets it even more when a Foot Assassin appears in the backseat of his car and stabs him to death. Elsewhere, Baxter Stockman brings Oroku Saki to the Techno Cosmic Research Institute offices; a back-up business he setup in case anything ever happened to Stockgen. He brings Saki inside and assures him that he’s been thinking several moves ahead all along and shows him the assembly line where Mousers and Flyborgs are already being produced. At the Second Time Around shop, April’s folks hit the hay. Nobody and Alopex, having just updated Casey on all the bad/good news, are about the leave when they see a crowd assembling in the street. It’s an army of Purple Dragons being led by the drunk and furious Hun. 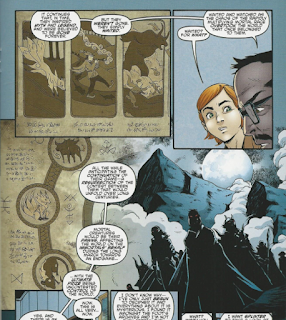 *This story is continued from TMNT (IDW) #45. 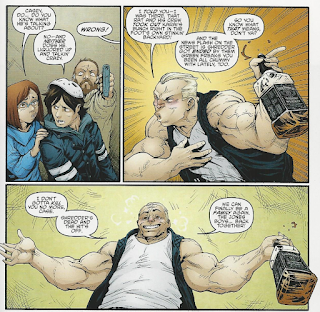 The story continues in TMNT (IDW) #47. *The events of the TMNT: Free Comic Book Day 2015 special occur during this issue, between pages 20 and 21, I guess. *Bebop and Rocksteady trashed Metalhead in TMNT (IDW) #44. *April threatens Dr. Miller by mentioning the time she punched him in the face, as seen in TMNT: Secret History of the Foot Clan #4. *Baxter mentions learning chess from his father, as seen in TMNT Villains Micro-Series #2: Baxter. *This issue also included a 5-page preview of Onyx #1. *This issue was originally published with 3 variant covers: Cover A by Santolouco, Cover B by Eastman and Pattison, and Cover RI by Alberto Ponticelli and Jay Fotos. Whew! So much stuff! It’s amazing how much material this comic can pack into a slim 22 pages. The storytelling is economical, but by no means rushed. While the numerous concurrent plot lines do mean things sometimes progress in baby steps, the arcs don’t feel too terribly bloated or condensed. Admittedly, the 4-issue stories do read better in trade than monthlies, and I admit that I harp on the pacing from time to time, but I will never say that a narrative feels short changed. Everything ultimately gets its due. It’s a stark contrast to Mirage’s TMNT Volume 4, which I’m currently in the midst of reviewing. It breaks up the narrative into just as many concurrent character arcs, yet issue after issue, it constantly feels like NOTHING is progressing. And that book has 30-plus pages to work with each month! It’s like night and day between these two Turtle books. Anyhow, this issue seems to have a running theme of “heart to heart talks”. Most of the sequences feature characters having one-on-one conversations with each other about what they’ve been through and how they should handle things. Alopex/Raph, Fugitoid/Don, Mikey/Woody… And April/Dr. Miller, though they’re more about setting up a future plot line than getting to the root of their feelings. It’s a catch-up sort of issue, as the characters stop to reflect and develop their relationships with one another. Raph and Alopex further their little will-they-won’t-they thing, Woody continues to exist as a character who does nothing but exist as a character, and the Fugitoid drops some helpful hints about getting stuck in a robot body. In regards to that last one, the relationship between Don and Professor Honeycutt (the Fugitoid) is one I’ve been waiting to see expanded ever since they started chatting during the Krang War arc. Honeycutt has been taking on a mentor role in regards to Donatello and now that they’re more alike than ever, it’s great to see that developed. There’s also a part I may have been reading into too deeply, but the possibility intrigued me. 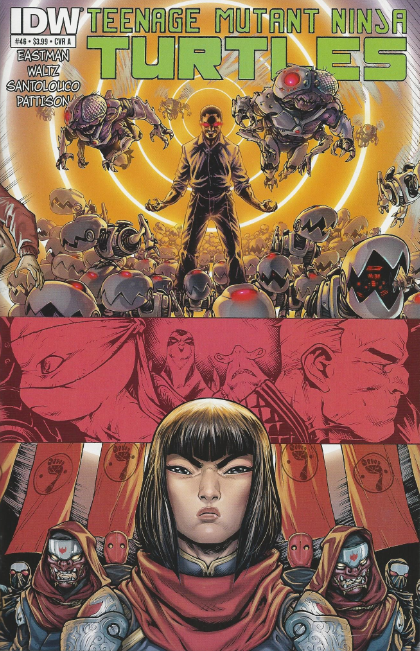 When Karai’s giving her speech to the Foot Clan, she places all the blame for the group’s troubles on “outsiders”. She calls them things like an “infection”, a “foreign disease” and a “cancer”, getting really nasty with her similes. While she says all this, Bebop and Rocksteady (a pair of outsiders brought into the Clan) share a glance and a scowl. Seems they might not be happy with Karai’s new direction for the Foot. Of course, they raise their fists and cheer at the end of the speech, so who knows. Maybe I saw something that wasn’t there. And hey, Dr. Miller’s dead. Not that he was really developed into much of a supporting character, having vanished for something like 20 issues before popping back up. I do sort of hate it when comics kill off characters for shock value, since it eliminates any opportunity for potential, but whatever. Miller never amounted to much, anyway. Maybe IDW can start weeding out the ten zillion characters Eastman introduced in the 2012 Annual, next? More importantly, we’ve gotten some background on the Pantheon and apparently the setup for the upcoming Casey & April miniseries. I’m stoked for that, as April and Casey have been suffering in the ongoing for a while now; Casey as a punching bag and April as… uh… whatever you call something that’s completely irrelevant and useless. …Deadweight! That’s the word I was looking for! Whew. Tippa muh tung. Oh yeah, and Hun was pretty funny for a change. Santolouco decided to play up his drunken shambling for laughs and I’m glad he did. Hun has had so many “serious game changer” talks with Casey that the exercise has been wearing thin, so playing the scene for drama and tension would have felt tiresome by this point. All in all, well, I guess I’ll just reiterate my opening point. A lot of STUFF happened! In 22 pages! It’s pretty impressive. Gone are the days when I felt this comic had Bendis-style pacing. I also felt like this issue made very good use of its page count. Even though it was all a bunch of folks talking to each other, it really felt worth it as we got to know a little bit more about what each character is dealing with. I also wondered if this issue had more pages than normal. "…Dr. Miller begins to regret his decision to betray the Foot Clan. He regrets it even more when a Foot Assassin appears in the backseat of his car and stabs him to death." You made that sound almost poetic. It's too bad that Foot assassin didn't whisper, "It's Miller Time!" as he carried out his assignment. I have to admit, I laughed at the Miller Time crack. Heh. It was a good issue with great back-and-forth (my only complaint was Miller finally appearing after 20 issues only to be killed off). And yes, I particularly enjoyed all the character interactions and moments, Angel lightly chiding Apolex on Raph, the Fugitoid/Don exchange and even more subtle moments like Apolex introducing herself nicely to Beth or, best of all, Shredder bristling at wearing a suit. In the comparison to Mirage Vol. 4, it certainly reads that way, doesn't it? But the current IDW writing style is basically Mirage Vol. 4 done right, IMO. If only the dialogue would improve, but it still serves its purpose and nothing like the ellipses spam that was Mirage Vol. 4. Imagine if IDW TMNT did that, or better yet, don't. Can't wait for next month, with the flying Mousers and flyborgs with Mouser hands. Oh, my. I think it was good to eliminate Dr. Miller. This leaves room for April to become a keeper/seeker of ancient foot knowledge, making her character deeper and more essential. We have already been shown her intelligence, now she gets to use it. And it makes way more sense than having her train to fight. If this issue didn't convince people that Alopex is basically just Ninjara with a new backstory, then nothing will. Seriously, she's basically the perfect example of "new paint, old character." You should probably do a write-up of Ninjara and Alopex at some point. It's really shocked me when the #45 Don end up inside the metalhead, but seeing he have some conversation with fugitoid about this situation kind bring the hope. By the way, I recall somebody said the IDW TMNT will end in #50. And now I just wondering, is that possible? The Pantheon thing still remain to be explain, or they just going to finish the Shredder in #50, so the story can focus on those three. The series will continue past #50, it's just a question of if they'll continue with #51 or relaunch with a new #1 for marketing purposes. I'm so happy... can't wait to read it !!! The vol 11 isn't (hasn't ?) issued yet... fortunately you are here !! "If this issue didn't convince people that Alopex is basically just Ninjara with a new backstory, then nothing will." I think she's completely different than Ninjara. Ninjara took over half the scenes she was in... a very aggressive character. Alopex, much like the animal she's based off of, is a stalker. She mostly watches from the sidelines, and she tends to always be on the periphery of the scene and the moment both. She's more of a "speaks when spoken to" type character (except for those brief moments in the villain mini issue and the end of the Dark Leo arc where she turns on Shredder, and both times gets burned for it). I think a lot of the reason why people criticize the IDW comic's development of Alopex's personality is because we don't really get to see much of her personality, since she usually sticks to the shadows. Ninjara, in juxtaposition, is a character who sticks out like a sore thumb in the Archie comics, plot-wise AND visually. "Ninjara took over half the scenes she was in... a very aggressive character. Alopex, much like the animal she's based off of, is a stalker. She mostly watches from the sidelines, and she tends to always be on the periphery of the scene and the moment both." "... Ninjara, in juxtaposition, is a character who sticks out like a sore thumb in the Archie comics, plot-wise AND visually." And you just described exactly why I prefer Alopex: she doesn't take over the storytelling, and lets the focus be more on the Turtles themselves, both as individuals and as a unit.